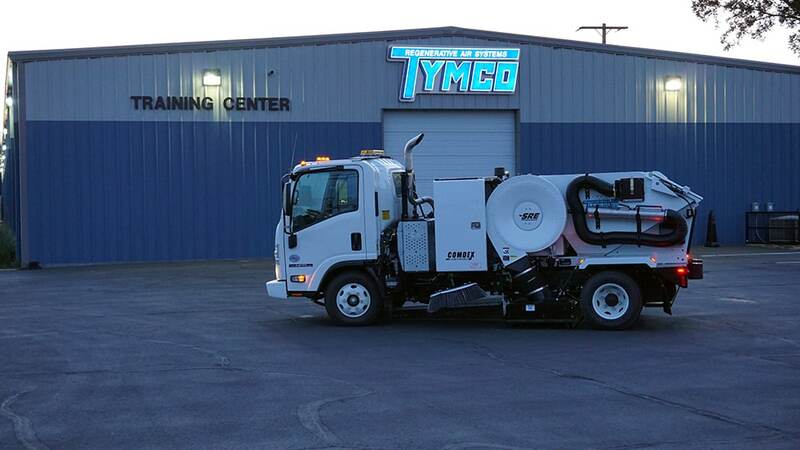 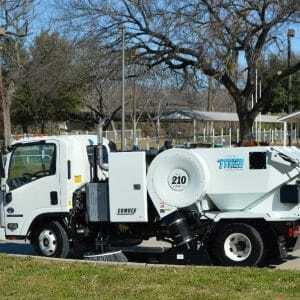 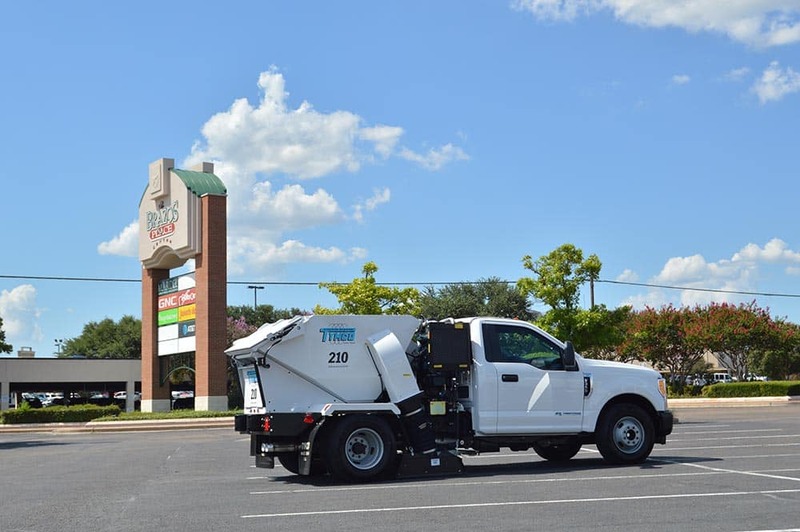 The TYMCO Model 210® is the parking lot sweeper with both power and maneuverability that you need to get the job done. 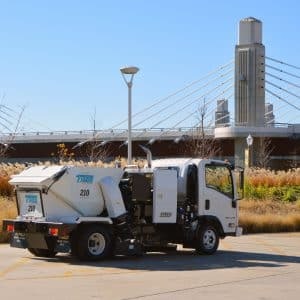 With a height clearance as low as 6’6” and a large 2.4 cubic yard hopper, the Model 210 is ideal for tackling a downtown parking garage or the largest of parking lots. 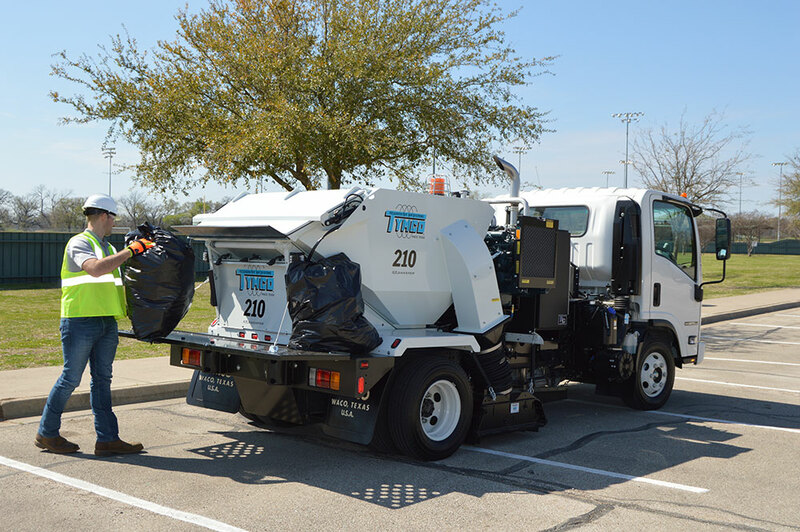 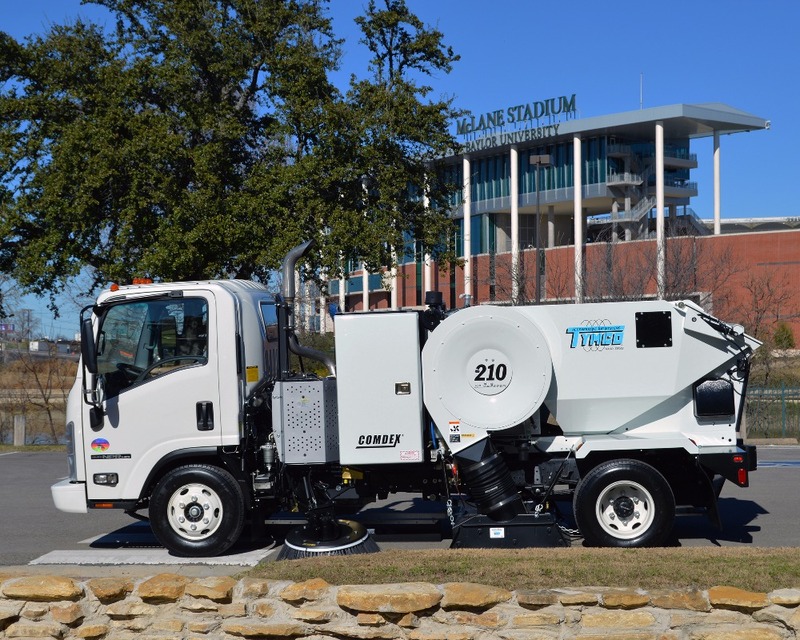 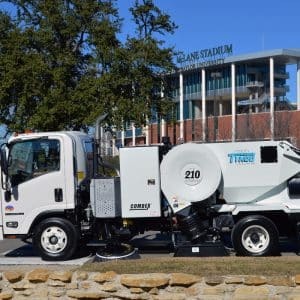 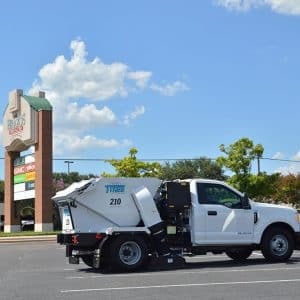 When other parking lot sweepers are too large, and small outdoor ride-on or walk-behind sweepers have proven inefficient, time-consuming and maintenance intensive, the Model 210 is your sweeper. 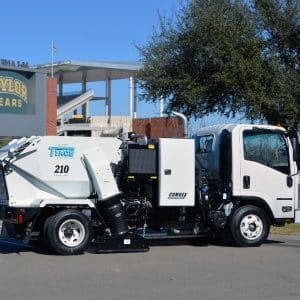 The Model 210's powerful piggyback hopper dump cylinders lift the hopper up to 60 inches for dumping into dumpsters or containers commonly located near parking lots and garages. 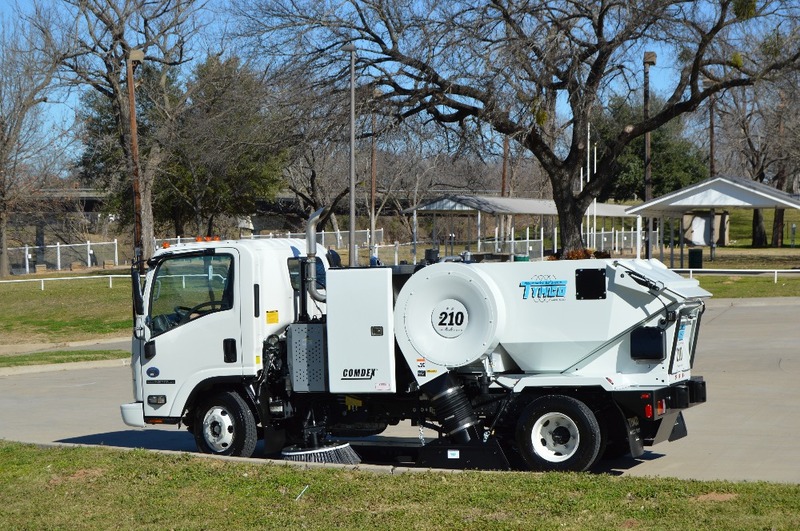 These heavy duty dump cylinders allow the Model 210 to high dump even the heaviest of loads. 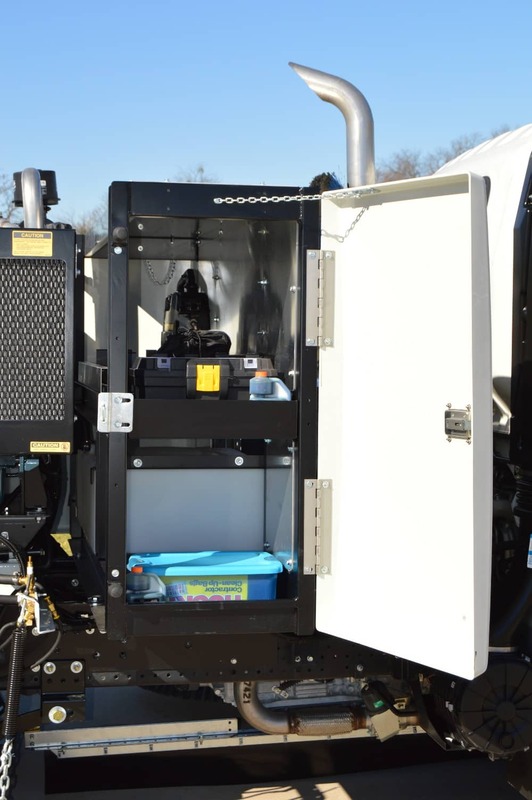 A built-in safety strut is permanently attached to the hopper frame for easy accessibility when performing routine maintenance. 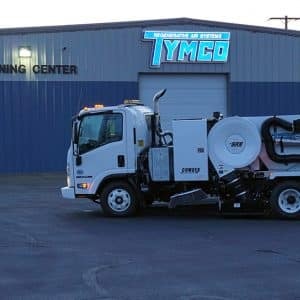 TYMCO's inherent design for conserving water while providing excellent dust control allows the Model 210 to pass the strict South Coast Air Quality Management District (AQMD) Rule 1186 standard for excellent dust and PM10 control. 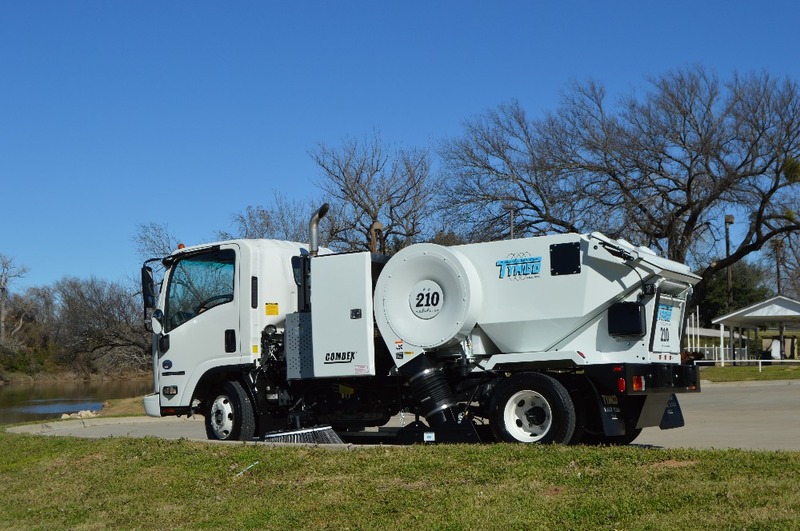 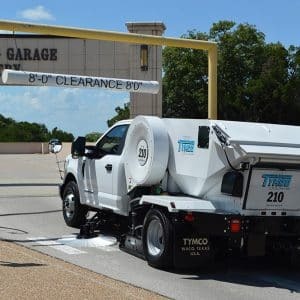 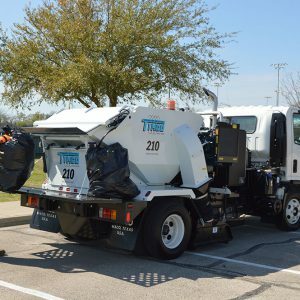 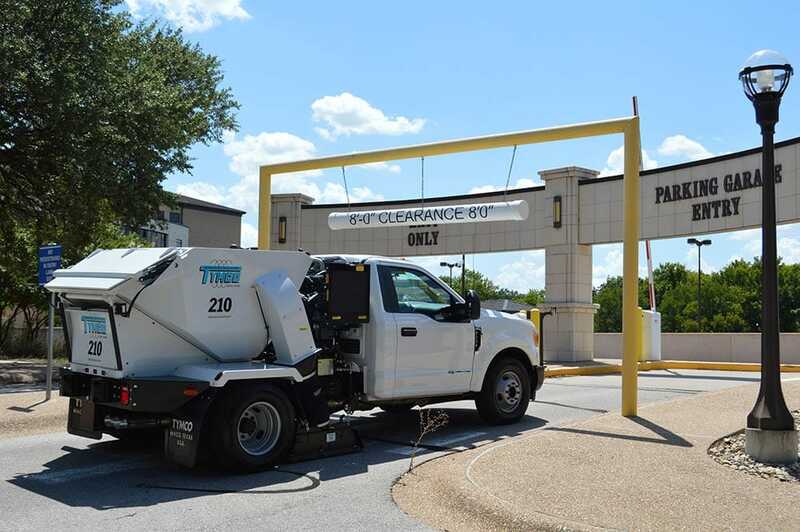 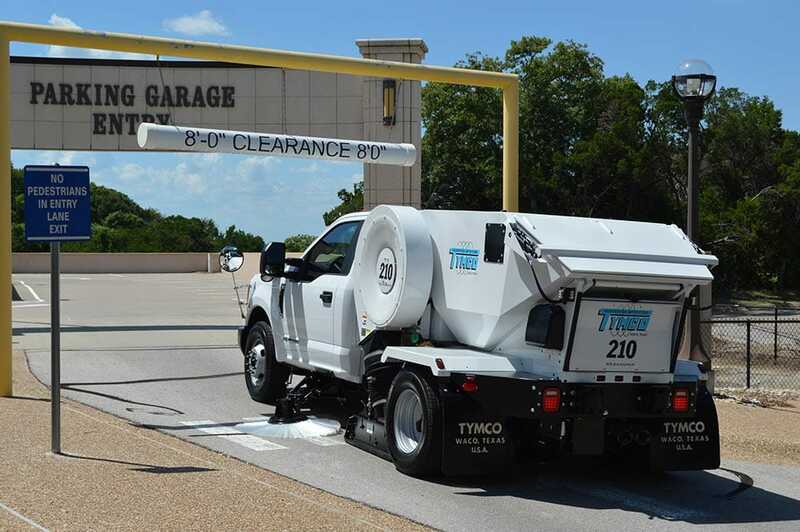 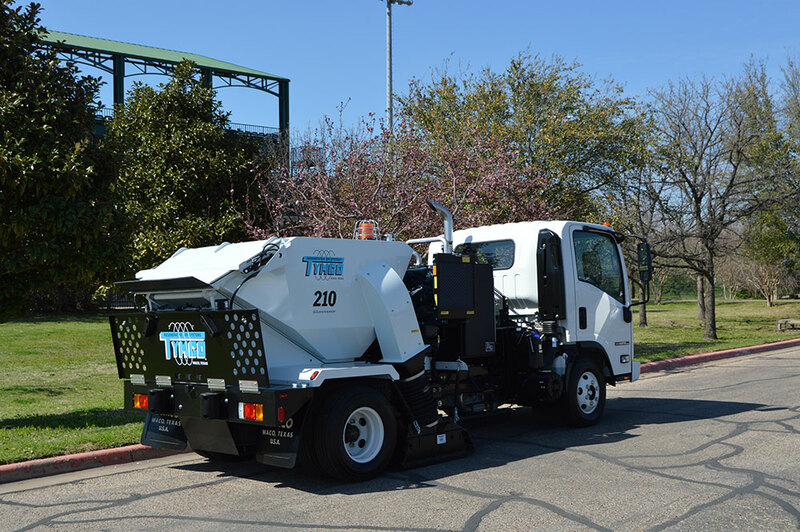 The TYMCO Model 210® polypropylene-wafer gutter broom assists in removing debris from around parking lot islands, medians and parking bumpers with a 32" diameter gutter broom with in-cab controls. 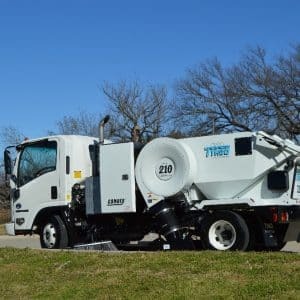 Steel digger gutter brooms are also available providing for more versatile cleaning and extended gutter broom bristle life. 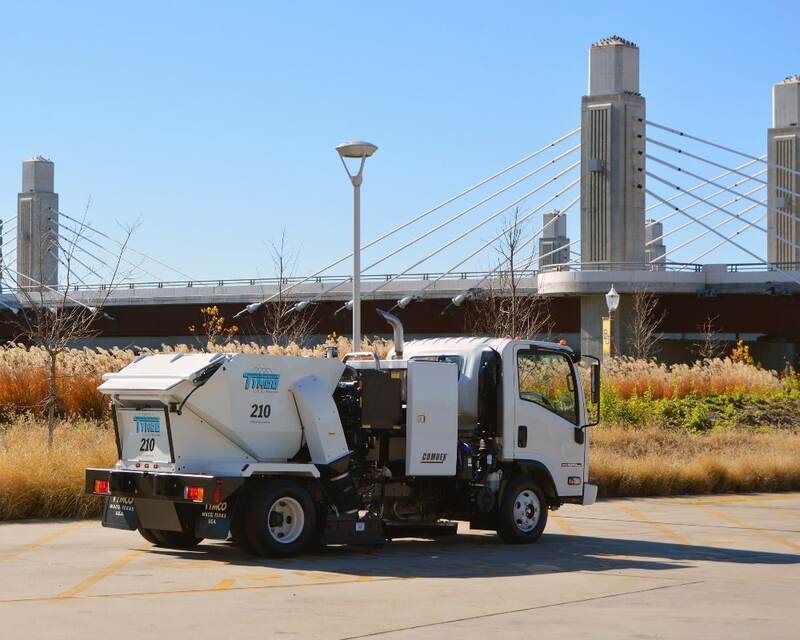 The gutter broom tilt adjuster uses in-cab controls to adjust the gutter broom to the pitch of the surface being swept. 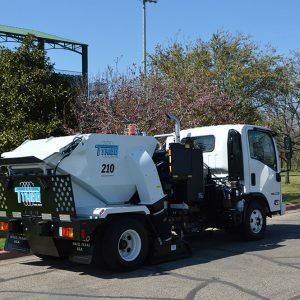 The deepest curbs or gutters along parking islands, medians or parking bumpers are no challenge when your Model 210’s gutter brooms are equipped with tilt adjusters. 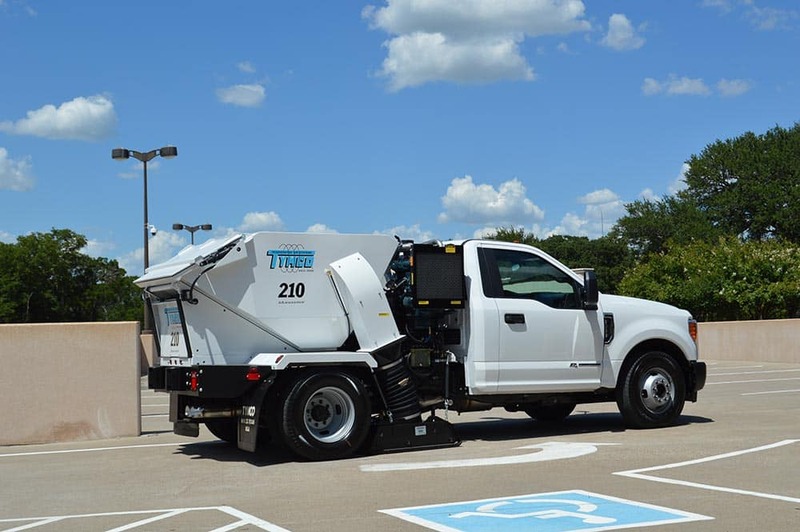 The Sound Reduction Engineering (SRE) Package allows the Model 210 to sweep parking lots where only truck engine noise levels are desirable. 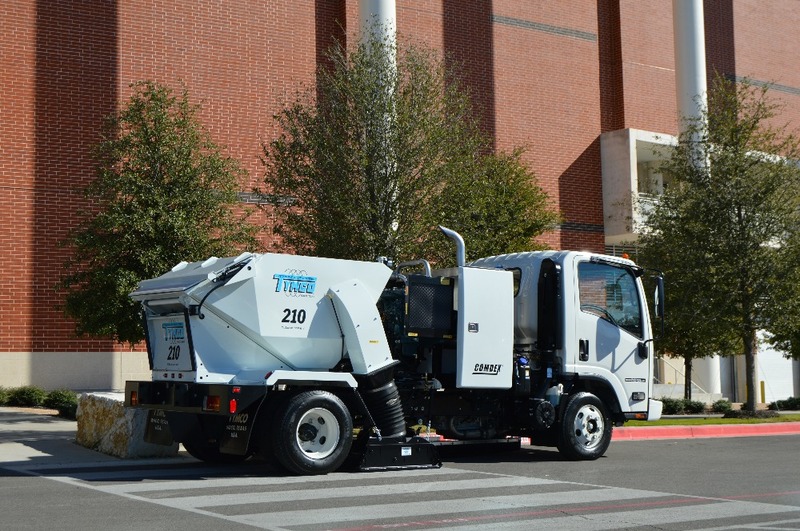 SRE isolates various noise sources on the sweeper and addresses those areas through elimination or redesign. 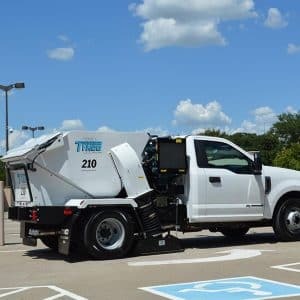 Sweeping parking lots and garages located near residential areas with noise pollution restrictions are not a problem when your Model 210 is equipped with SRE. 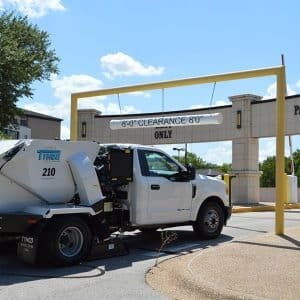 Parking lots and garages are full of support beams, signs, light poles, trees and many other objects that need to be seen when backing up. 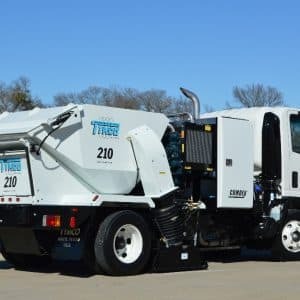 The rear view back-up camera with in-cab display allows the operator to view the area behind the Model 210 while backing up providing additional safety and peace-of-mind to both Model 210 operators and owners. 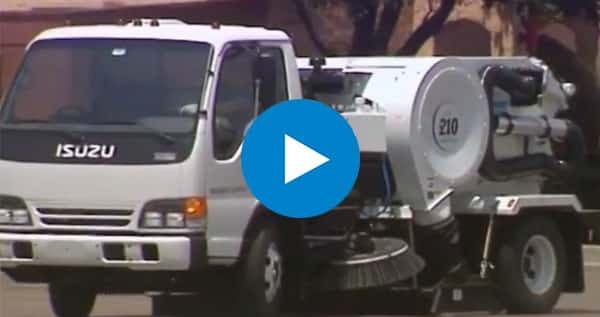 Additional cameras are also available to view the pick-up head and gutter brooms. 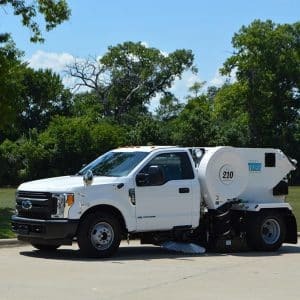 A large 39.5 cubic foot storage box with optional extra water capacities, access to truck batteries, and easy access for brooms, shovels, rakes and additional tools that might be needed while sweeping heavily landscaped parking areas. 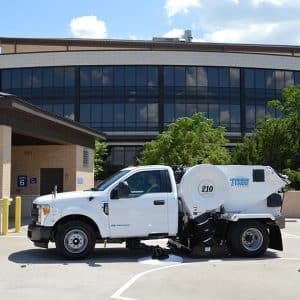 Every parking lot has sidewalks that need to be cleaned. 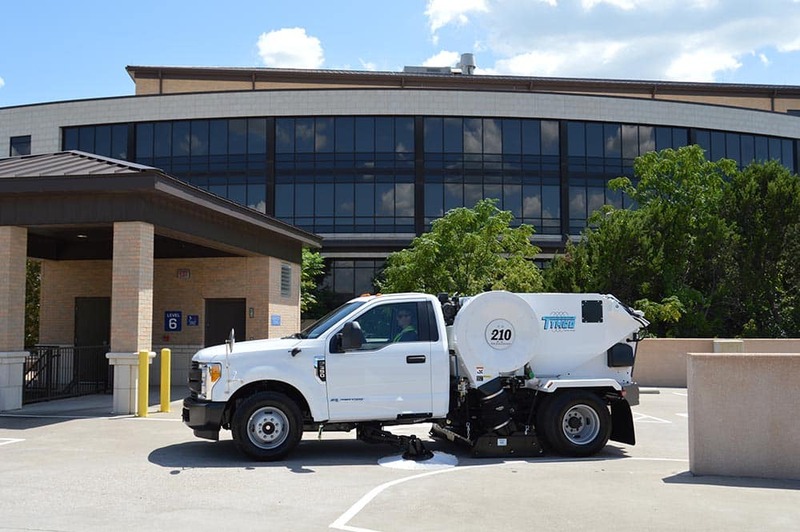 This storage box provides a place for the Model 210 operator to store a backpack blower to clean off sidewalks before sweeping the lot. 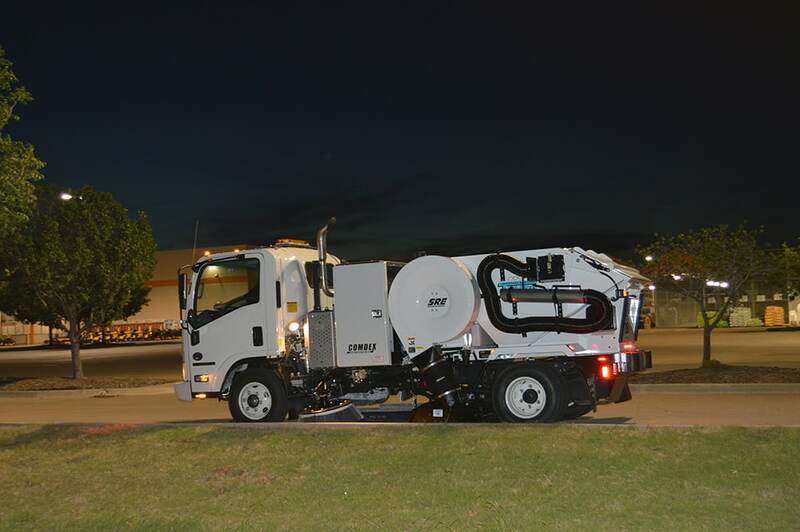 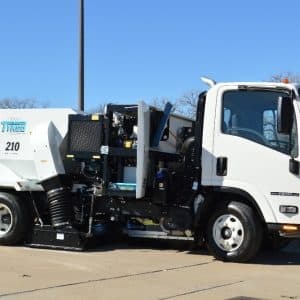 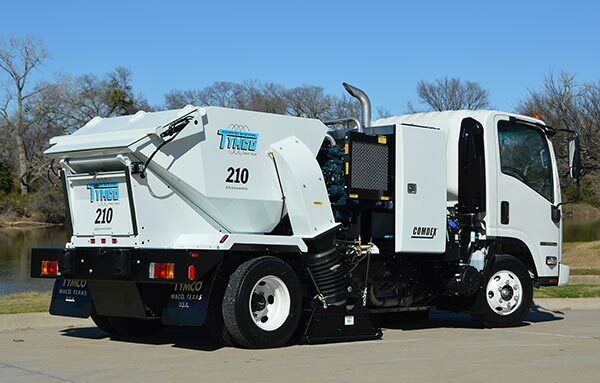 Allows the Sweeper to be driven and operated from the right side (or passenger side) as well as the left side for easier and more efficient sweeping of the right hand gutter area. 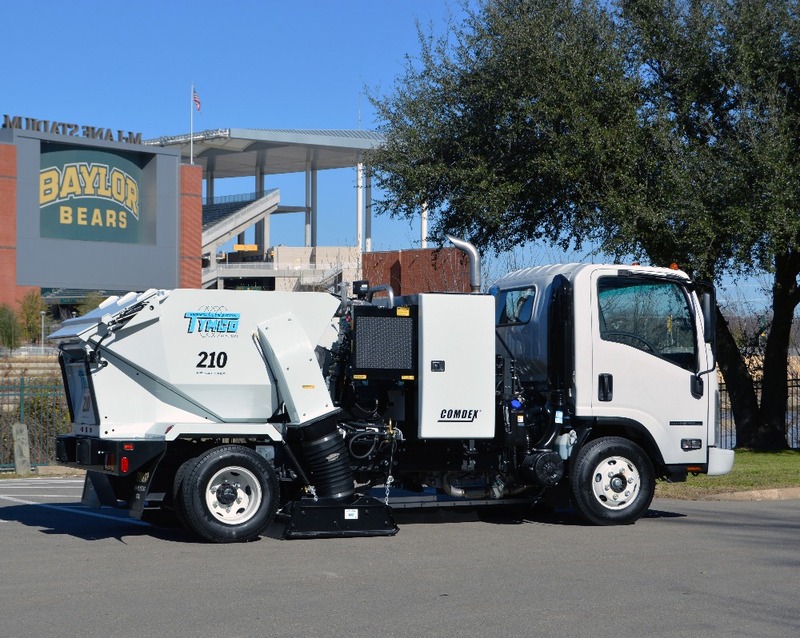 Hydraulic actuated and retractable roller assembly that provides the pick-up head with the ability to sweep large volume of light debris. 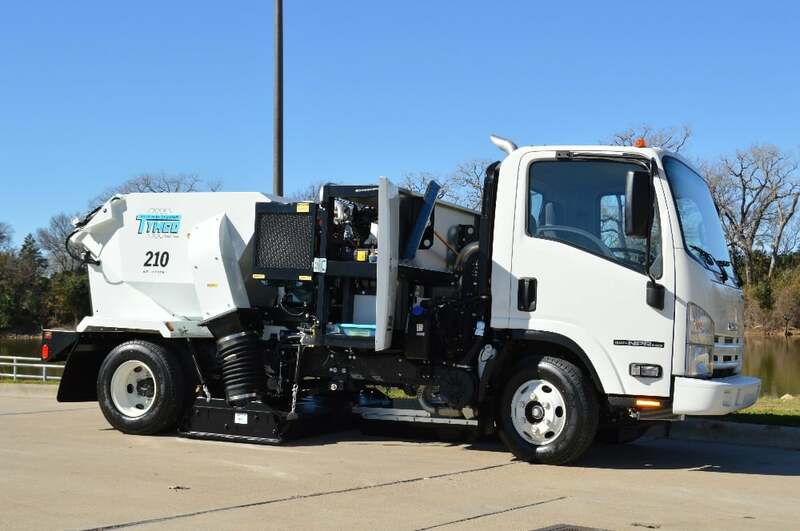 Electronically controlled in cab. 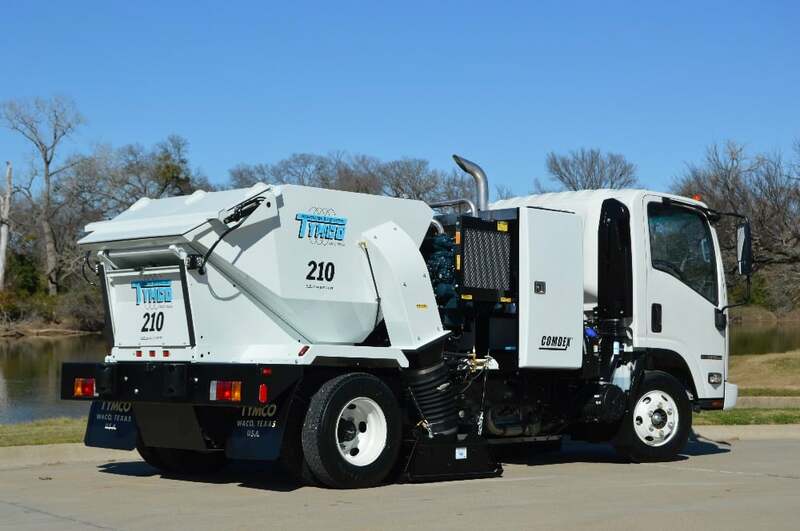 On diesel chassis, diesel auxiliary engine fuel is supplied from chassis fuel tank. 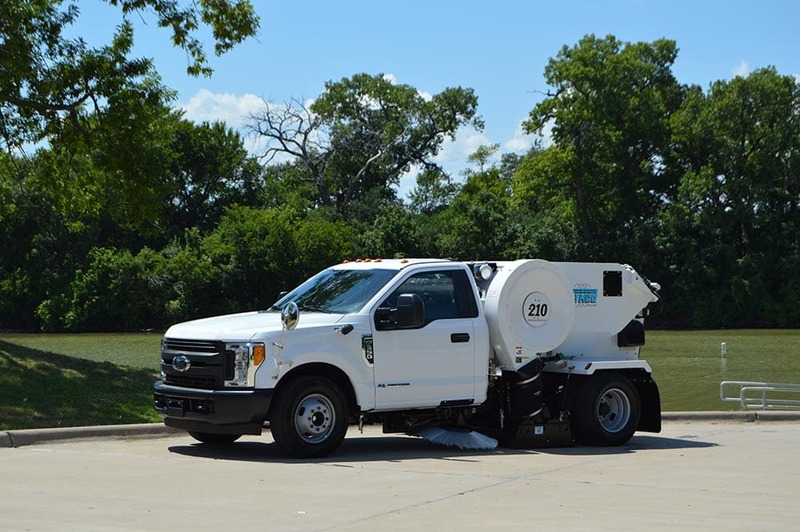 On gasoline chassis, diesel auxiliary engine fuel is supplied from a separate fuel tank. 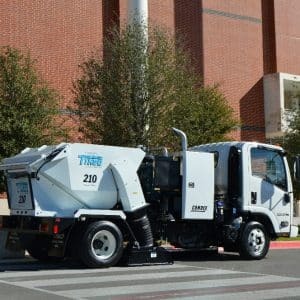 Multiplexed electrical system includes hardware and TYMCO designed software that integrates the in-cab controls to the auxiliary engine and sweeper functions; as well as provides intelligent safety features and On-Board Diagnostics (OBD) for the auxiliary engine and sweeper through the BlueLogic Display. 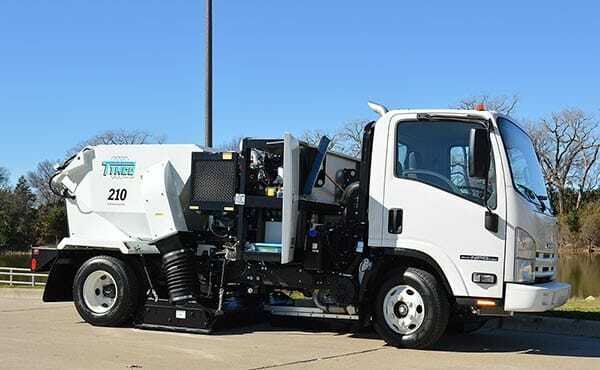 Pedestal mounted touchscreen display provides sweeper and auxiliary engine data to the operator and includes hour meters (trip and total) for the auxiliary engine, gutter broom(s), pick-up head, blower, and water pump (if applicable), sweeper odometer (records curb miles swept and sweeping hours), service reminders, custom reminders, overspeed warning, low water audible alarm (if applicable), dust control system winterization guide, and OBD. 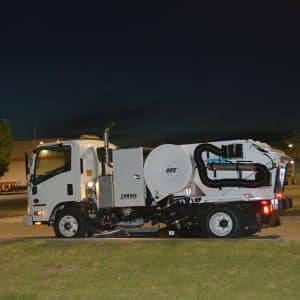 Leaf pressure bleeder control, BlueLogic display, illuminated control switches: pick-up head, gutter broom(s), auxiliary engine RPM, dust control water system nozzles (if applicable), safety lights. 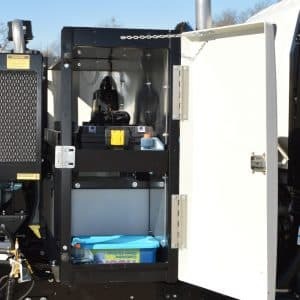 Dump switch, BlueLogic multiplex module.